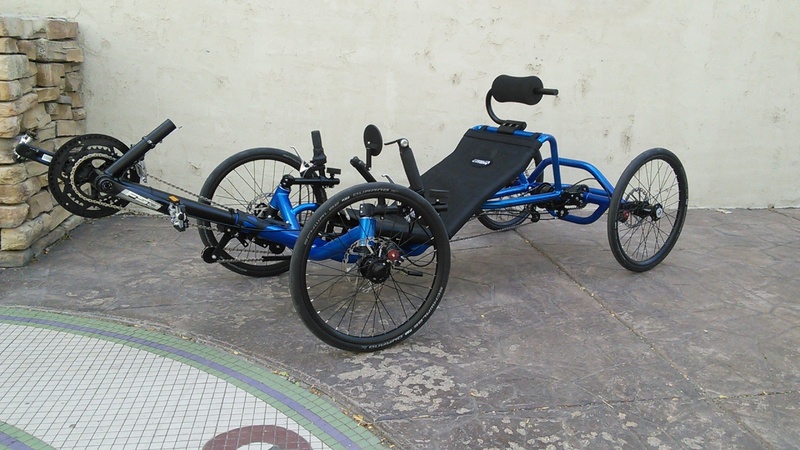 The Catrike Cat-4 Quad turns the Catrike recumbent trike platform into the ultimate utility vehicle with our custom two-wheel drive rear axle. With enhanced stability, increased weight capacity, and lots of room for cargo, the Cat-4 quad is the pedal car you always wanted. The Cat-4 Quad is made in the USA and features many custom gearing options. We now have two custom differential options available. Our geared differential is perfect for road riding performance whereas our new posi-trac differential is all about traction on loose surfaces or even two-wheel tricks. When we first talked with Catrike about making a Quad they were excited about the prospect. There were several designs built and tested over the past three years, but it was really this past year that things started coming together. Not only have we finished building our own machine shop and fabrication facility, but also several members of the Utah Trikes staff have been trained and certified in Solidworks, TIG welding, general fabrication, and powder coating. 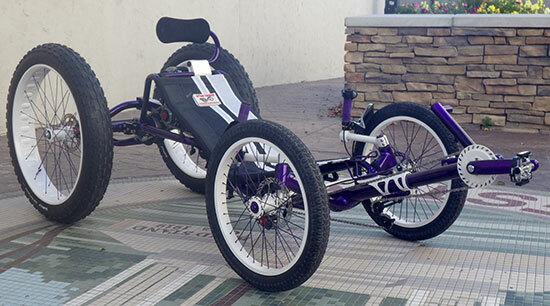 The stars lined up, and just before the 2012 Catrike Rally in Florida we completed our last prototypes and were able to demo them at the Rally. 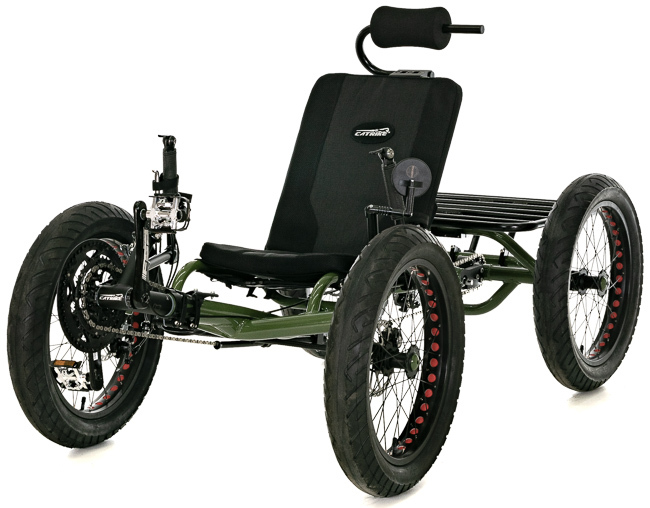 The Quad has been designed for those looking for a true pedal car. The additional cargo capacity, traction, and 4-wheel disc braking make it the perfect utility vehicle for touring and commuting. 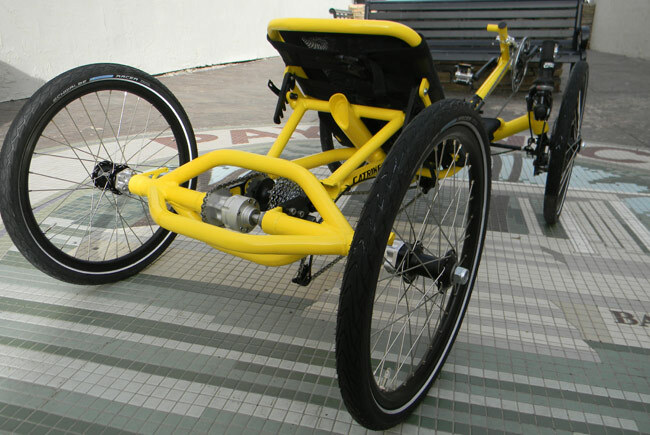 The Quad conversion of the Catrike changes the handling characteristics of the base trike. The stability of the Cat-4 Quad is the best we have encountered on any cycle. The unique change to the geometry makes the Catrike ride like its on rails. It wants to go straight like never before. 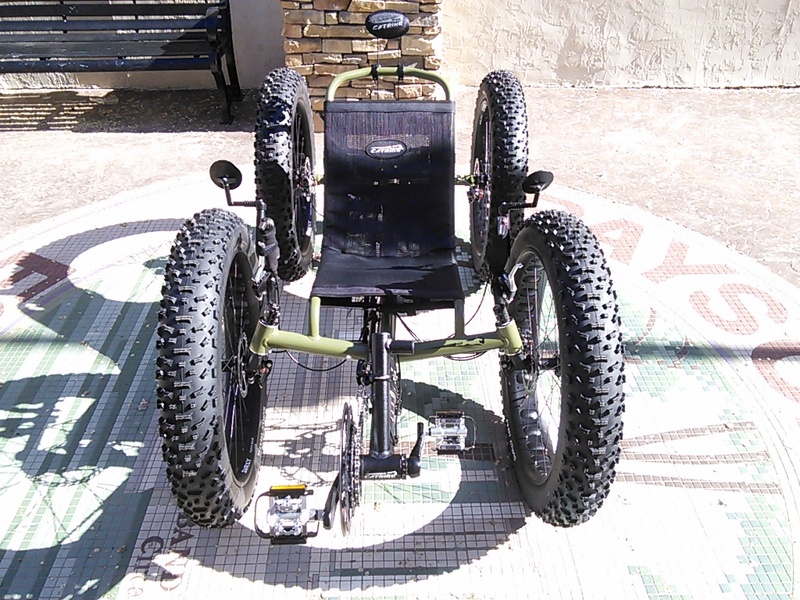 The Quad housing and mounting system is manufactured entirely in-house by Utah Trikes. All parts of the housing are machined in-house which allowed us to do a lot of testing and create an efficient production process. 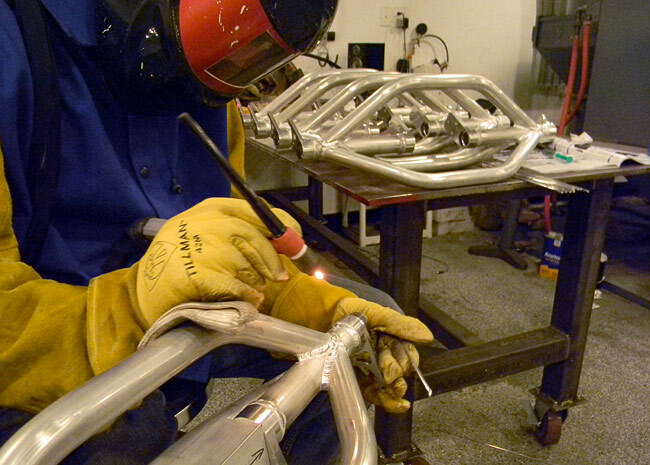 The inner and outer mounts act as their own jigs during assembly and welding. We built our own coping machine to mill the three bracing supports so there is a no-gap fit and perfect alignment. We use oversized tubing throughout, so that despite weighing less than three pounds, our cage can easily support over 500lbs of applied weight. 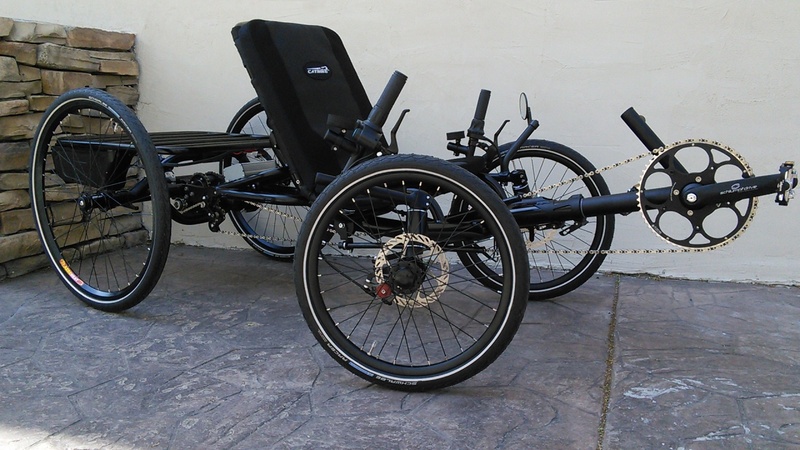 With the combined axle system we've raised the rider weight capacity of the Catrike to 350lbs with a combined rider/payload capacity of 500lbs. 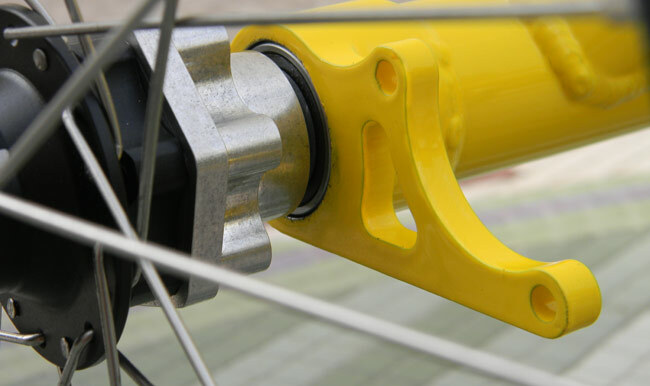 We started out by designing a coupling system that allows us to use the stock Catrike dropouts to hold a middrive. 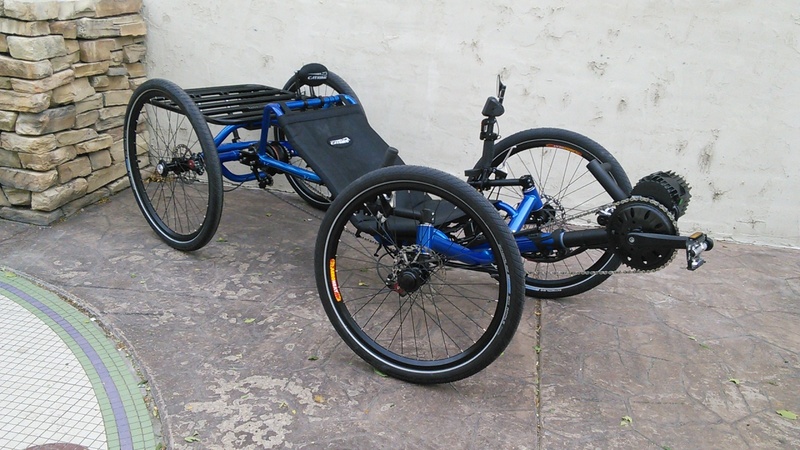 The beauty of this setup is that Catrike�s already efficient chainline can be used and mostly off-the-shelf hubs and transmissions can be used for gearing. Using a middrive gearing system instead of running the gearing directly on the rear axle offers many advantages. 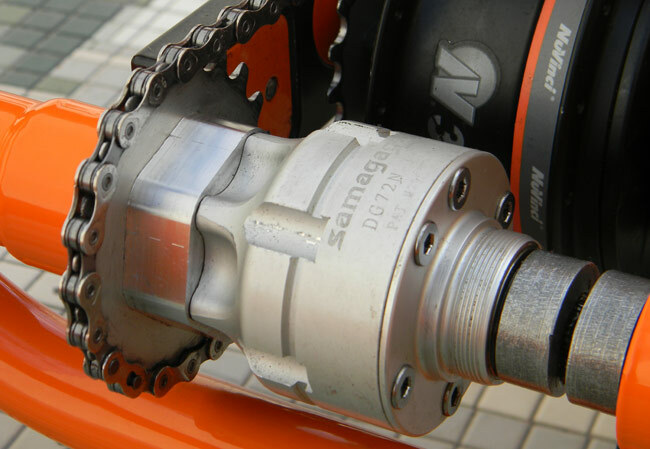 Our middrive coupling system allows for the use of derailleur-based gearing as well as any of our Internally Geared Hub (IGH) transmissions. 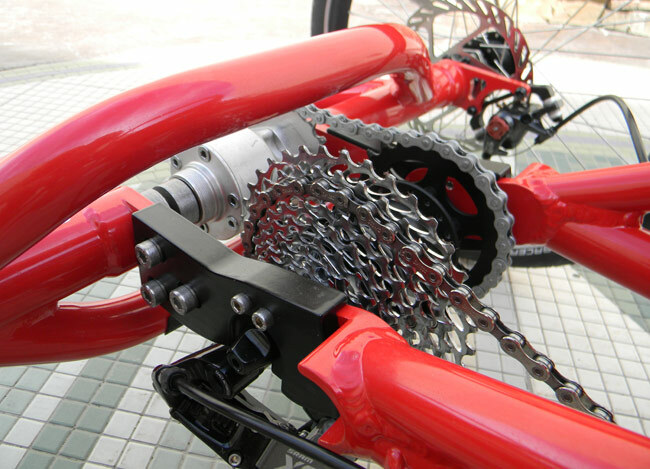 Being able to use derailleurs on our Quads is a first for us, and makes for a very efficient drive train. For performance riders, the derailleurs are hard to beat, but they do leave the rear derailleur exposed making this setup mostly suited for road riding. The IGH transmissions offer wide gear ranges, ultimate reliability, ease of riding, and increased ground clearance. Besides being able to use a variety of gearing systems the middrive systems allows us to have a lot of control over the final gearing. For example, if we use the standard gearing found on the Catrike Trail up to the middrive and then use a 26t sprocket on the middrive with a 20t sprocket on the axle we raise our gearing to be equivalent to running 26-inch rear wheels. By choosing different drive sprockets the gearing candidates be geared as low or high as you want. 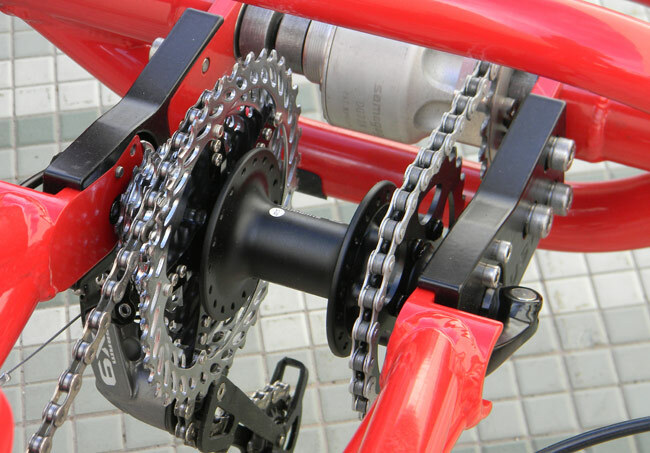 This allows the rider a lot of control in choosing their ultimate gear ratios. We are using a modified Samagaga geared differential with 17mm hardened steel axles. Despite being slightly heavier, we decided to go with the thicker axle to give us more strength and allow us to use a high-quality bearing. Each axle is machined to attach to our own custom rotor mount. We chose to create our own rotor mount so that we could use OEM Catrike wheels on the rear of the Quad. The wheels attach by mating to the rotor mount and then secured with a centering shim and 16mm locknut. This make removing the wheels easy and the entire assembly very modular. All Cat-4 Quads have provisions for optional rear brakes. If you choose the four-wheel Avid BB7 disc brake option you can choose how you want the brake levers setup. The default setup is as a motorcycle with front brakes on the right side and rear on the left. We can also set the levers up like a mountain bike with the actions reversed and the left lever actuating the front brakes. For the performance riders we can setup the right and left levers to control the right and left calipers respectively. The performance setup is especially suited for fast cornering and two-wheel tricks to prevent differential slippage. We have a complete cargo system for the Cat-4 Quad and will be releasing many other attachments that fit on the Quad including generator, gas and electric motor assist, trailer hitches, fender kit, and a canopy system. Is a Quad for you? 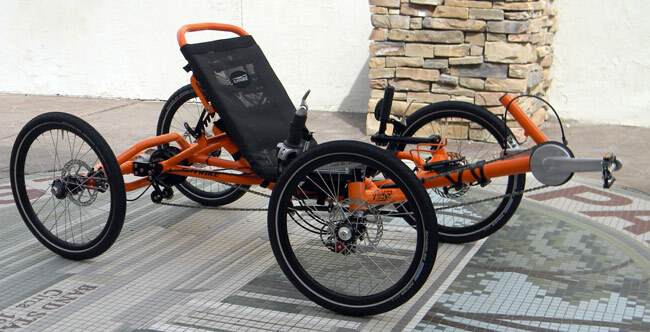 If weight is your primary concern, then you are probably better off with the trike or even a skinny-tire carbon road bike, but the mere 13lbs our rear end adds to the Catrike brings a lot to the table. The Cat-4 Quad is a performance-oriented option for those wanting utility, traction, or simply something a little difference. 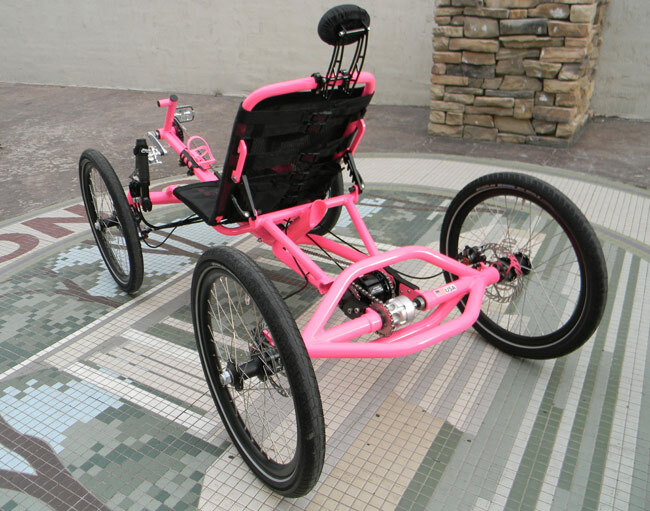 As an upgrade, the Quad kit can be painted to match all the existing Catrike colors, in addition to any colors offered by our Custom Color Shop. 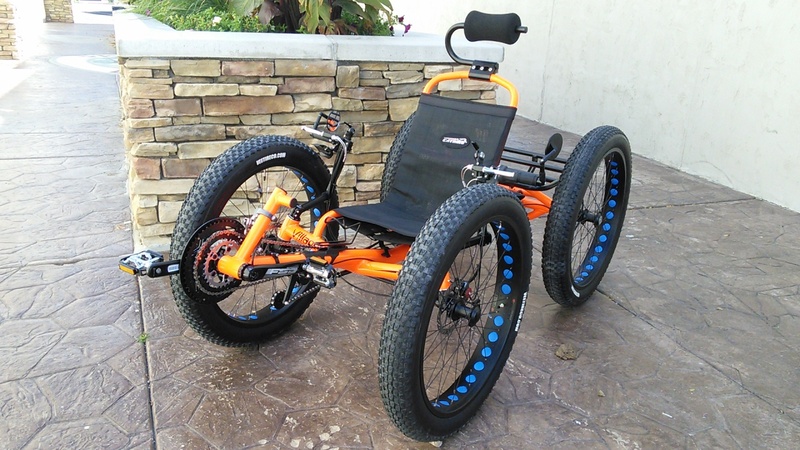 The Quad kit can be purchased through Utah Trikes and select Catrike dealers. We have 500W, 750W, and 1000W systems preconfigured under the FRONT GEARING option as well as other motor options. Of course, we can add additional batteries for increased range. Just let us know and we'll make sure you get the right setup!